This individual scoring drill drill is among the resources for both coaches and player available from basketballhq. They have several more videos as well as basketball coaching resource articles. BasketballHQ has just released their Basketball Coaches Training Group. In the group you will get access to different workout plans that are going to be for the team as a whole, by position, by the number of players and more. This is an all inclusive training group that is going to allow you to walk onto the court with a full workout plan in hand for your players through our easy to use Iphone and Android App. Every drill comes with a video breaking down the details of the drill, and all of the videos are instructed by a Pro or College coach and demonstrated by a high level player. click here for More Information on the Basketball Coaches Training Group. I have posted a sample from the Coaches Training Group below the first video. The Coach in the video is Ryan Panone, one of the co-founders of Basketball HQ. I do realize that there are no chairs on the floor during a basketball game. I do realize that defenders move during a game. You can set the drill up with whatever landmarks you want to use to show your players where to execute their dribble moves, or you can just have them use their imagination as to where to practice their moves. I do feel that is is essential to have players practice moves before using them in a game. Any drill you pick up from another program or coach has to be modified to fit your needs. My philosophy behind this site is to get you thinking about ways to improve the drills that you use. 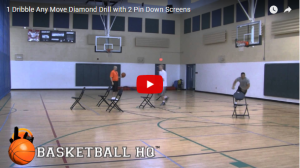 You can come up with a scoring or timing system to make this drill competitive as well. Here is a 2:00 minute sample of the type of content that is available in the BasketballHQ Coaches Training Group.